Standard rate turns should still be fresh in your mind, so now is a good time to start putting them to use—by making landings from a standard airport traffic pattern. We'll use MacArthur again, since you're now familiar with that field. The flight itself will be a very short one, because you'll never leave the airport pattern; however, you'll be repeating the procedure a number of times. This is an excellent type of practice, and you'll find it particularly satisfying—exhiliarating, in fact—when you get it right. It will take a few tries, but stick with it and you'll find it worth your while. Airport Traffic Patterns. 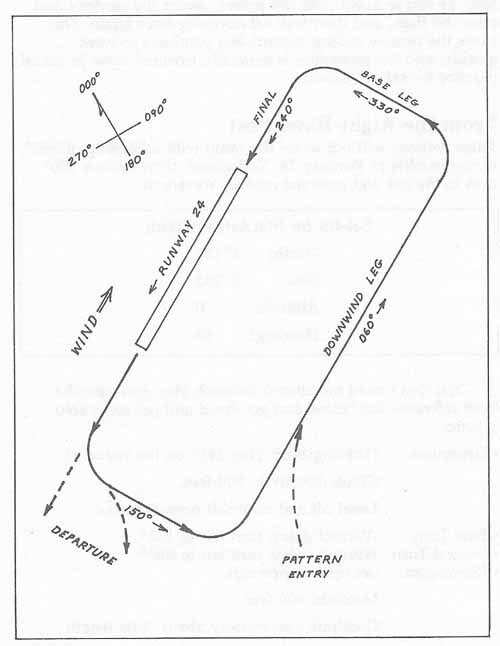 The standard airport traffic pattern is a left-hand race-track pattern, as shown in Figure 2-2. At some airports, a right-hand pattern may be used, to keep traffic away from a residential area or an obstruction, but left-hand turns are the norm. This standard pattern is always used where there's no operating control tower—and is commonly used even when the airport has an operating tower, but the tower will often give clearances that differ from the pattern. On the other hand, the standard pattern is rarely used when you're arriving on an instrument approach. In that case, you follow the published approach procedure, as we'll discuss later on. Standard-Pattern Departure. As shown by figure 2-2, on a standard departure you begin your climb, then begin a left-hand turn, and then turn right to leave the pattern. It's not unusual, however, to just climb out straight ahead. Standard-Pattern Arrival. Always enter an airport traffic pattern near the start of the downwind leg, as shown in the figure 2-2. And always get down to traffic-pattern altitude and level off before you actually enter the pattern. Traffic pattern altitude is ordinarily 800 feet above the airport elevation. At MacArthur, therefore, where the field elevation is 99 feet, traffic pattern altitude is 899 feet (900 feet, for practical purposes). Flying the Pattern. On this flight, you'll remain in the traffic pattern from takeoff to landing. Takeoff. Climb directly to traffic pattern altitude, and level off at normal cruise. First Turn. Without delay, start a standard rate turn to the left, and come around 90° onto the crosswind leg. Second Turn. Without delay, start another 90° left turn and roll out on the downwind leg, parallel to the runway. Downwind. On the downwind leg, you have ample time to slow down and set up for the approach in the usual way. Pass the end of the runway; then continue on for a distance of about half the runway's length. Third Turn. Make another 90°, standard rate turn to the left, onto the base leg. On this turn your airspeed is lower than it was before, so the degree of bank for a standard rate turn will now be shallower than before. Base Leg. When you roll out on the base leg, reduce power and begin a standard 500fpm descent. Final. On establishing a descent, turn left 90° again, rolling out on the runway heading. Use engine power and gentle banks to adjust your glidepath to the runway. Don't hesitate to use the overhead radar view from time to time during the procedure, to keep track of your position. Touch-and-Go Landings. To simply touch and go, as soon as you're down, add full power, center the controls and raise the flaps, and then take off normally once again. This saves the time of taxiing around, but you have to work quickly, and the procedure is generally frowned upon in actual practice for safety reasons. These settings will put us on the ramp with a heading of 060°, facing parallel to Runway 24. Taxi ahead, then make a 180° turn to the left and onto the runway threshold. You don't need me aboard to coach you—just use the brief reference list below, and go ahead and get some solo practice. Climb directly to 900 feet. Level off and establish normal cruise. • First Turn. Without delay, turn left to 150°. • Second Turn. Without delay, turn left to 060°. • Downwind. Set up for approach. Continue past runway about ½ its length. • Third Turn. Turn left to 330°. • Base Leg. Reduce power, establish 500fpm descent. • Final. Turn left to 240°.